Liquidpiston - It's a Rotary, but it's not a Wankel? 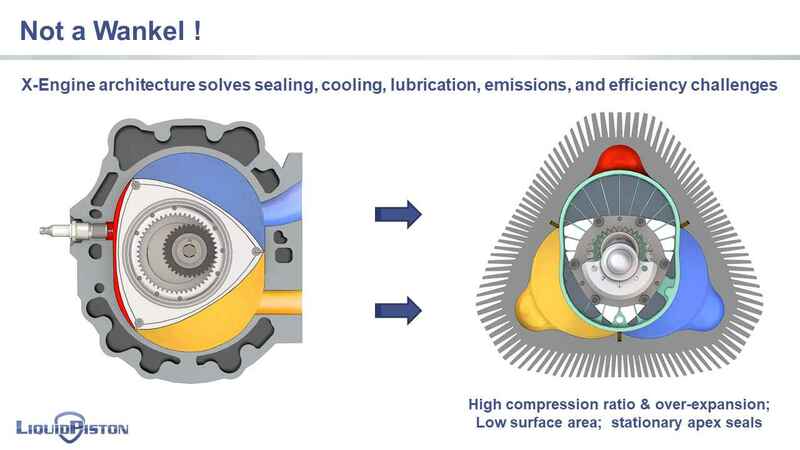 Its been quite the journey, at LiquidPiston, and we’ve been making great progress towards the development and commercialization of our new rotary engine technology. Our two engine programs are coming along well. The 250cc/chamber X4 engine core made 30.4kW at 34% efficiency (on net indicated basis), exceeding DARPA program objectives. Not a bad start. And the X-Mini engine has been converted to run on Jet fuel for the Army, and inserted into a 2 kWe hybrid electric generator, which will begin field testing with the Army in May. We are in discussions / negotiations with a number of companies toward inserting the engine technology into their products. We signed our first deal (feasibility study) with an automotive company, and will hopefully announce deals in the aircraft and UAV sectors soon too. For anyone that would like to check out the investment opportunity, which closes today, please see https://wefunder.com/liquidpiston. We appreciate all the support of our investors - we’ve raised over $2M from over 1000 investors.